Have any of you spotted that restaurant trend that features mini greens as a final garnish on a special dish? Have you noticed petite little sprigs of greens sprinkled into salads and tucked into sandwiches? If so, then you’ve noticed micro greens. 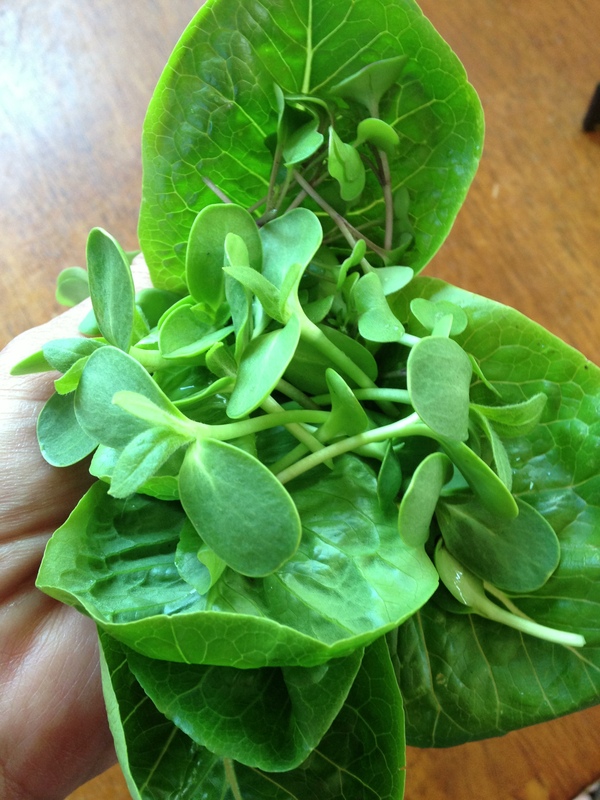 A nifty specialty item that sits between sprouts and full grown greens, micro greens have been gaining traction lately. Highly nutritious, they are easy to grow and delicious to eat. I’ve been a fan of micro greens for some time. Many years ago when we vacationed on Vancouver Island, I’d always reach for the sunflower sprouts at the local grocery store. Locally grown and displayed in messy tangles, the sunflower sprouts were only few inches long but they packed a bright and succulent crunch when tucked into our hearty whole grain sandwiches. Even though I hunted for sunflower sprouts here in the Seattle area for years, I’ve always been hard pressed to find them in grocery stores around here. This spring, while perusing the Johnny’s Selected Seeds catalog. I noticed that they had a massive selection of micro green seeds—everything from basil and kale to a sorrel and shiso. Distracted by planting my regular garden at the time, I put “Grow Micro Greens” on my garden to do list and a couple weeks ago I finally circled back to the task. I surveyed the garden for a suitable spot and mail ordered an array of seeds from Johnny’s (arugula, basil, spicy and mild micro mix, cress, sunflowers and kales). Simple to grow, I’ve been amazed at how lovely these little greens are. We’ve been tucking the powerhouses into sandwiches and sprinkling them on top of sliced tomatoes. Right now my micro green adventure has been pretty easy because I have been growing them in seed trays in a little greenhouse that I purchased from Amazon in February. This method has been great because the trays are at eye level and I have positioned the greenhouse in a protected area where the greens won’t get fried by the sun. I check them each morning to make sure they are sufficiently moist and I spritz or water as need. I’m still pondering how I will grow these during the cooler months but for now, I’m happy with the operation at hand. Freshly snipped sunflower and red kale micro greens carried in a lettuce cup. So, here are some quick tips for growing microgreens. Buy some seed starting trays and good top quality potting soil. I used those basic seed starting trays that you can get at Fred Meyer or Home Depot. I sprinkled in high quality potting soil and opted NOT to use the seed starting mixes because I thought they would be too light. The potting soil works great. Sprinkle the seeds generously but not too densely and water. In my first tray I visualized three different sections and grew three different varieties. This worked pretty well but in my next trays I kept to one variety for each tray simply because the growing times and heights were different. Keep the trays in an area where they get some sunlight but avoid full sunlight all day if possible. Seedlings are fragile and I find that partial sun/shade prevents them from getting fried by the midday sun. My greenhouse is on the southeast side of the house and gets shade by mid afternoon. Keep the trays moist and check frequently or the seeds might not germinate. When watering, use a spray bottle or a light spritz from the hose but avoid watering too hard or heavily because the potting soil will splash all over the greens and make them more difficult to wash.
Once the micro greens get their first two seeds, watch them carefully, let them grow to a couple inches and snip them with culinary scissors for use in the kitchen. Rinse before using.